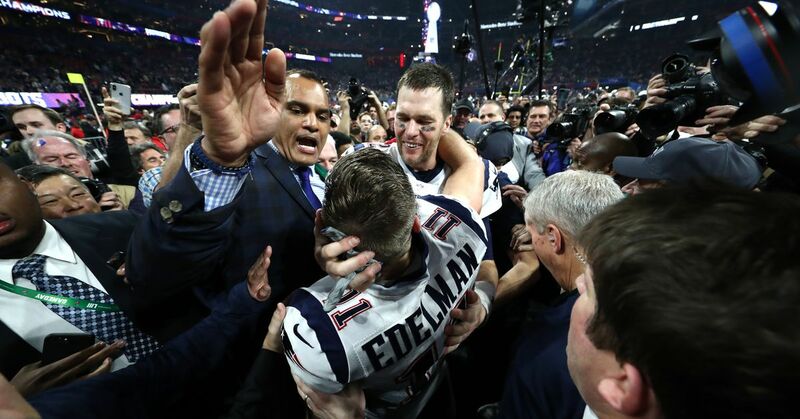 Moments after Tom Brady took a knee to run out of the clock to finish Super Bowl 53 to give the New England Patriots a 13-3 victory over the Los Angeles Rams, CBS tried Tracy Wolfson to get a post-game interview. Immediately, the quarterback was sworn by journalists and cameramen, and it became scary quickly. First of all, Wolfson started a walk-and-talk with Brady trying to get the interview going, but Brady wanted to share an embrace and some kind of words with Rams & Brand's Cookin. Then it was another Rams player. So Julian Edelman. So Bill Belichick. So Robert Kraft. With each new person shattered and pushed. With very few security guards detaining hordes of cameras and cameramen, 5 & 6; 6 Wolfson began to hit and push around. For Wolfson's credit she did not give up or cave for any of the forests, eventually getting the interview (after they had found the right CBS cameraman again). In a moment, things were tense, and thanks to the abundance of microphones around, one could hear different people asking if she was ok, and others demanded that people back up. "Jesus are you okay?" The security officer tells Wolfson. "Stay straight, okay?" It is thought that mental illness @tracywolfson is in the middle of the marks (and handles so well), my skin creeps. Why can't photographers give space?!? We know that we all have a job to do, but good gentlemen. The interview, when it was able to happen, went just fine.